In today’s world, there is much discussion and controversy concerning goals of martial arts organizations and individuals in the leadership roles. Unfortunately, many are fueled by egos and money. I personally felt it was time to give the readers of Kenukan Budokai Blog a checklist, a simple way to determine which path to take and which leader to follow. You may find out you haven’t been following a leader at all, only the “pied piper.” And, if you are a leader, or think you are, take note of the prerequisites I suggest are a must. 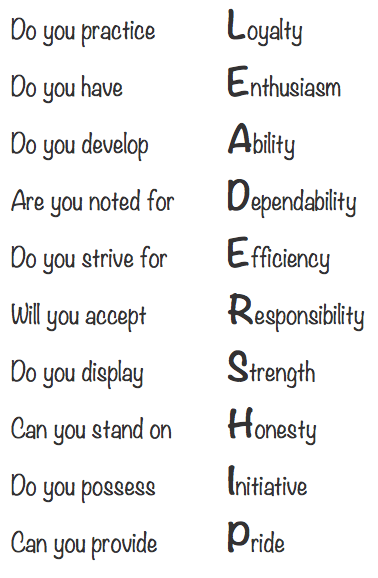 The ten signs of leadership listed below were shared to me by my father, retired Army Lt. Col., of whom he taught to his junior officers and NCO’s. My father and mother (leadership has no gender) always set the example of being a leader, physically, mentally, and spiritually. My thanks to them for their guidance, especially in showing me that all great leaders were great followers first. Mr. Jim Harrison (Missoula, Montana), founder of the Bushidokan and Ronin Jutsu systems and one of the most sought after practical self-defense instructors in the world, and the late Mr. George Anderson (Akron, Ohio), President of the USA Karate Federation and world icon for authentic karate-do, were also leaders that helped pave my career in martial arts by exemplifying these ten signs. My thanks to them for more reasons than I can express – groundhogs they were not! Finally, without hesitation, my son Travis has shown tremendous leadership qualities his entire life – especially since becoming the Owner and Chief Instructor of Kenukan Academy in 2006. He has been fortunate to have been surrounded by leaders throughout his life who have offered him national and international positions of responsibility which have allowed him to develop all ten signs of leadership. I mention him because he reminds me constantly where I need to stay steadfast; he serves as my daily check and balance. I am not going to expound each sign but leave that up to each reader. You may want to save this column for personal reference or to share with others. Now for the litmus test – Be honest! 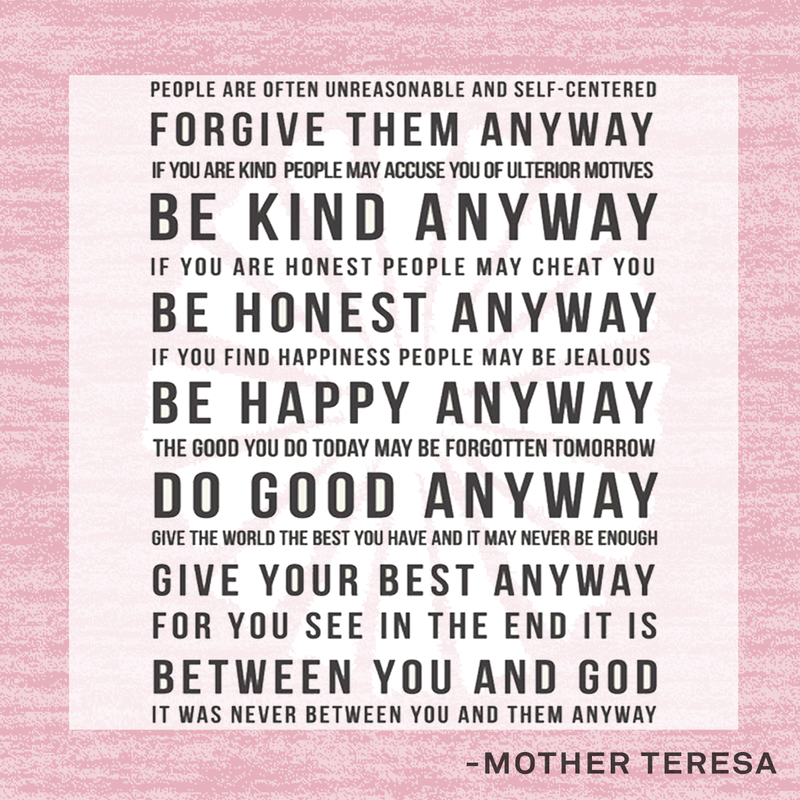 In closing, the following was written by Mother Teresa. These words I keep attached to the above 10 signs of leadership to remind me that the Lord is with me at all times and it is He I am to please. What Is Self-Esteem Worth Today? Unfortunately, society as a whole has made excuses for everything that falls short of “norm” or doesn’t run the course outlined by the “textbooks.” We have become a society of excuses for all failures. Why is it that we can’t accept the fact we just fall short or maybe can not muster the physical or mental stress? I remember a student of mine years ago, a yellow belt, who went to another academy and received his Black Belt in less than a year and a half. Upon keeping his dues current at my dojo, so as not to loose his membership, he came by one evening to make his payment while a green and white belt were present. I asked him the question, “Is it a fact, that every student in your Taekwondo Academy can, and will receive a Black Belt if they keep up their attendance?” Upon hesitation, and finally convinced that I wasn’t setting him up for a physical altercation and embarrassment in front of the other students, he said, “Yes. But Mr. Boggs, you don’t understand what Martial Arts is all about.” “Pray tell, what is it that I’ve missed over all these years? Please enlighten me,” I responded. My students at this time had backed up not knowing how their instructor of 30 years plus would react to this over-night sensation and philosopher. I was then told that if a student doesn’t receive his / or her Black Belt that the instructor has fallen short of his responsibility, the primary reason of teaching Martial Arts, building one’s self-esteem. Of course, I thanked my former student for his insight and opening my eyes. I told him the next time I was in an airplane, that it wasn’t important whether the pilot could fly the plane or pass the necessary tests. Let’s not make him feel bad or tear down his self-esteem! Why is it that self-esteem has to be sugar coating? My Dad taught me, maybe a strength and guidance lacking today, that if I was a ditch digger, be the best I could be. I tell my martial arts students that there is no shame in falling short of one’s goals, only shame in not trying. Self-esteem is a by-product of honor, courage, trust, spirit, and integrity – all character building blocks. We have to get away from the “feel good” philosophy to build self-esteem and get back to accepting our own responsibility, good or bad. If you are not teaching self-defense based solely on the student’s ability, but by time, money, or on friendship, then you are teaching fairy tales and producing wannabes. We tried so hard to make things better for our kids that we made them worse. For my grandchildren, I’d like better. I’d really like them to know about hand-me-down clothes and homemade ice cream and leftover meat sandwiches. I really would. It will be good if at least one time you can see a baby calf born and your old dog put to sleep. I hope you get a black eye fighting for something you believe in. I hope you have to share a bedroom with your younger brother. And it’s all right if you have to draw a line down the middle of the room, but when he wants to crawl under the covers with you because he’s scared, I hope you let him in. When you want to see a Disney movie and your little brother wants to tag along, I hope you’ll let him. I hope you have to walk uphill to school with your friends and that you live in a town where you can do it safely. On rainy days when you have to catch a ride, I hope your driver doesn’t have to drop you two blocks away so you won’t be seen riding with someone as uncool as your mom. If you want a slingshot, I hope your dad teaches you how to make one instead of buying one. I hope you learn to dig in the dirt and read books. When you learn to use those newfangled computers, I hope you also learn to add and subtract in your head. I hope you get razzed by your friends when you have your first crush on a girl, and when you talk back to your mother that you learn what Ivory soap tastes like. May you skin your knee climbing a mountain, burn your hand on a stove and stick your tongue on a frozen flagpole. I hope you get sick when someone blows cigar smoke in your face. I don’t care if you try beer once, but I hope you don’t like it. And if a friend offers you dope or a joint, I hope you realize he is not your friend. I sure hope you make time to sit on a porch with your grandpa and go fishing with your uncle. May you feel sorrow at a funeral and the joy of holidays. I hope your mother punishes you when you throw a baseball through a neighbor’s window and that she hugs you and kisses you at Christmas time when you give her a plaster of Paris mold of your hand.